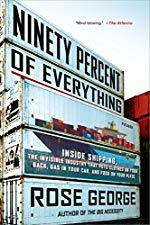 This book really gets into the grit of shipping freight by ship and how unbelievably sketchy the whole industry is, but also how it supports our modern lifestyle. Rose George actually embeds herself on one of these behemoths risking her own life to report the story behind the shipping container ship industry. One of my favorite parts in the book is a long discussion on modern piracy where George absolutely skewers the romantic notion of the high seas pirate. Those are bad people, but honestly, so are the dubious operators behind ocean shipping. Yeah, this is a great book - amazing look into something that's a part of our lives but really hidden from most of us. I worked in the freight industry for two-odd decades. Ocean carriers are the worst to deal with, then rail, then air, and motor is easiest. Well then Chrysostom you've either A)read this book already or B)should read this book as you have unique insight and it will be something you know or C)Shouldn't read this book because it might raise your blood pressure unnecessarily because people are terrible. B, I'd say. I find the transportation/logistics field quite interesting. But yes, people are terrible. The thing that kills me is that there's really no reason at all shipping has to be as exploitative and evil as it is. Per kilo, it's mindblowingly labour un-intensive, and it would be trivial to pay a living wage and avoid slavery first and foremost, but even properly registering and properly maintaining the freighters would cost nothing compared to the value of what they ship each year. It's so awful. looks interesting! I used to work for the conglomerate that owns the world's largest shipping fleet and this could be a good view of that side of the building. alchemist, here's an FPP about the incident I believe you are talking about. @chrysostom yes! I remember that one, and the Wired article as well. It was the very definition of the curse "may you live in interesting times....."